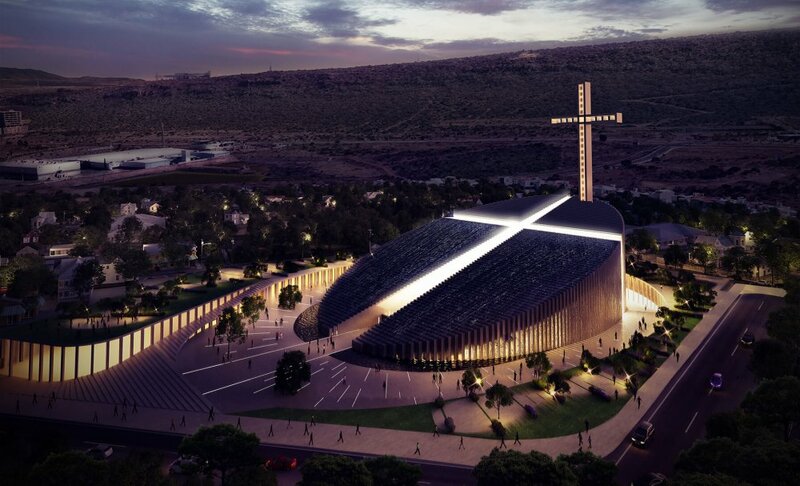 In response to calls for a larger space, the Santiago Apostle Cathedral is the proposed home for the Queretaro Diocese. The proposed building lies on a 20,000 square meter plot of land on the city's south central side. 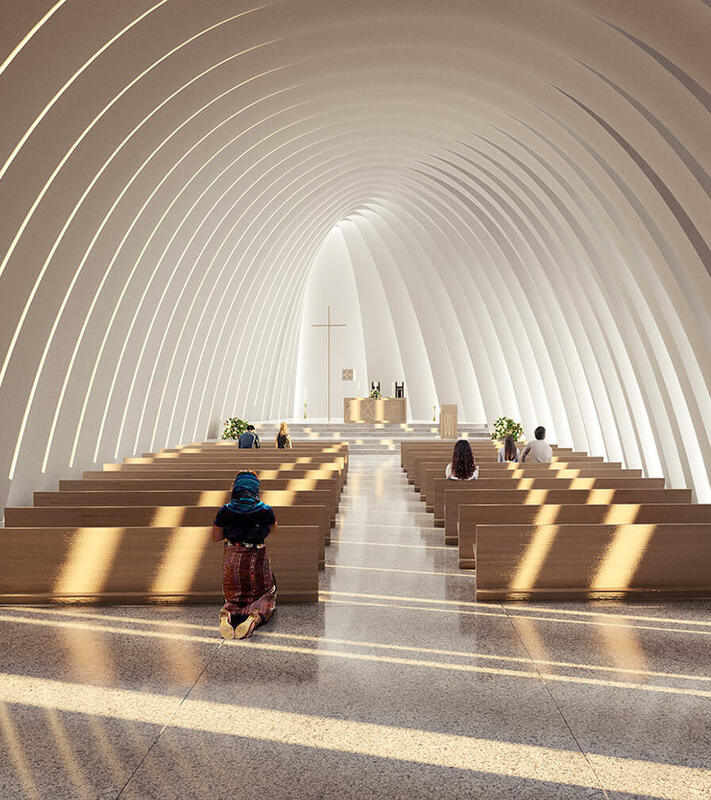 The project aims to turn the building into not only a new religious and community space, but also an architectural icon for the city. The project's design is based on a guiding axis that points towards the rising sun. The nave's geometry begins in the circle and then spreads throughout the structure from the principal entrance all the way towards the altar. The cathedral's roof is made up of a grand staircase that also houses a reflection pool. 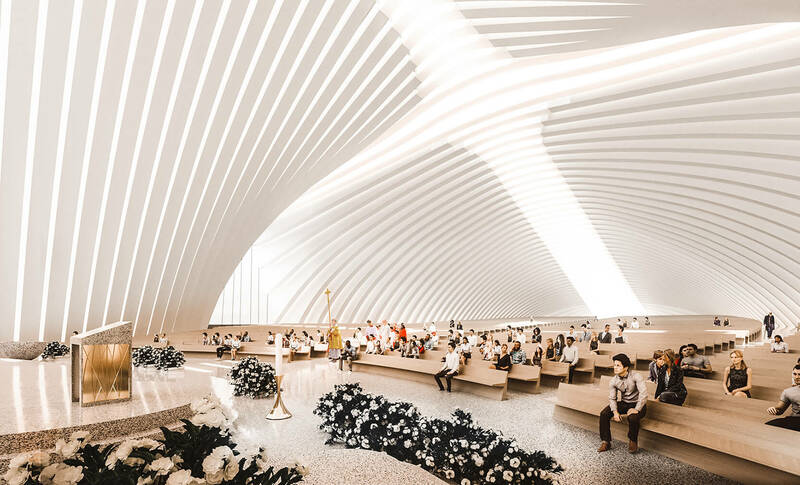 The cathedral's interior utilizes religious and architectural symbols used by the Church throughout its existence, most notably the Latin Cross-shaped skylight that allows natural light to enter and highlights the cathedral's nave and center aisle. 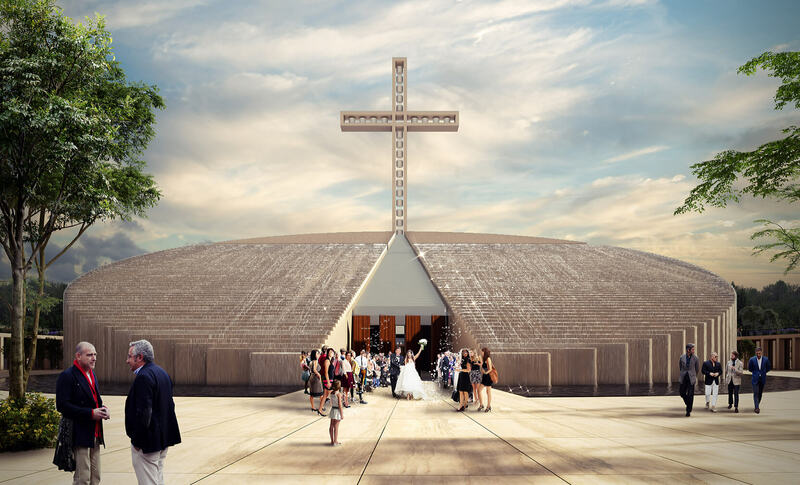 The cathedral will be able to seat 3,000 worshippers in the main nave while two smaller side chapels will hold 100 people each. 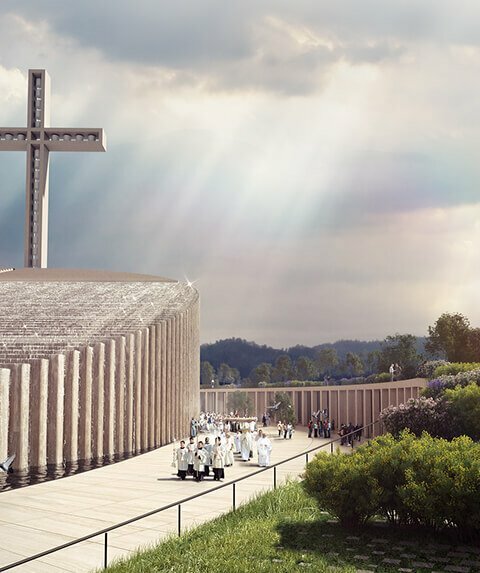 To either side of the altar, there will be 3000 crypts lining two ascending spirals. The crypts are situated in such a way as to allow one to look towards the altar or towards the outside gardens in contemplation or reflection. Another 3,500 crypts are located around Capilla del Santísimo (Chapel of the Most Holy), which is located beneath the altar. The structure is crowned with a 65-meter high cross that also acts as the bell tower, creating a new urban landmark within the city. The rest of the structure is based around the atrium, that acts as a catalyst for public life, drawing inspiration from the colonial cloisters that unwrapped around the central patio. In this case, however, the atrium extends towards the main avenue, allowing it to permeate the city's public life from the heart of the cathedral. 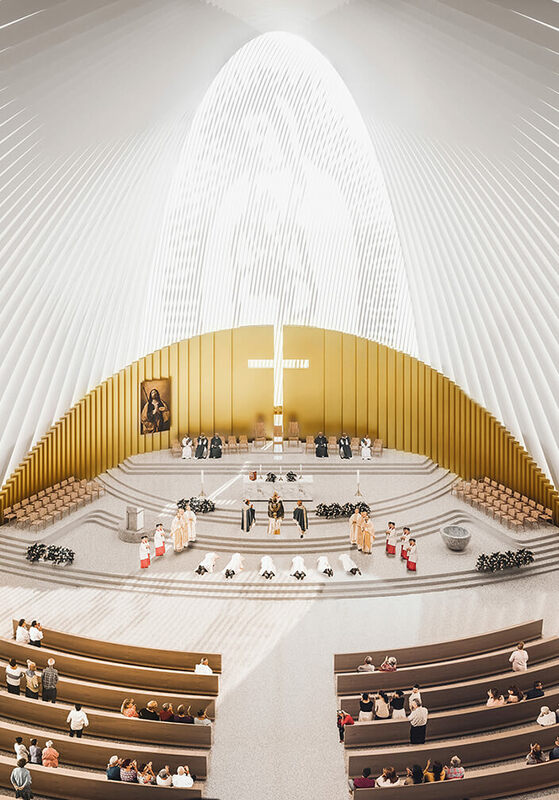 The plan for the pastoral area includes an auditorium able to seat 1000: six rooms able to hold 100 people each, six smaller rooms able to hold 50, the Bishop and Diocese's office space, and service areas like the kitchen and bookstore. 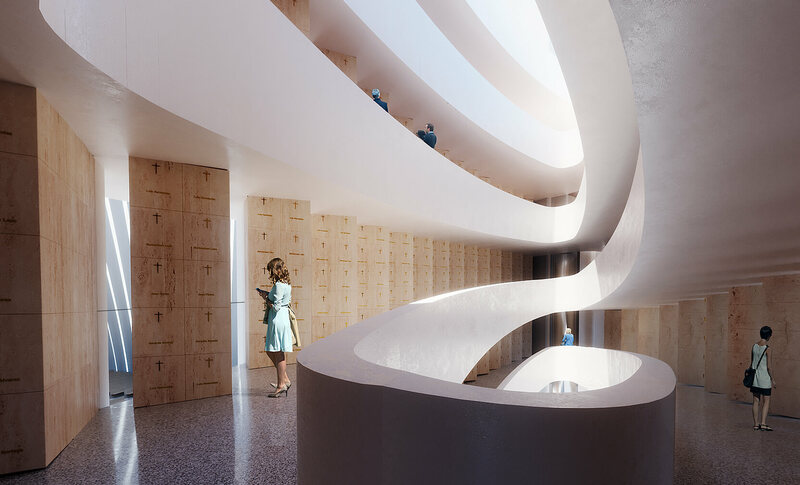 The residential area for priests is located in the east wing of the building and will be divided into two parts, each one with its own private garden as well as other spaces dedicated to the private life of its occupant. 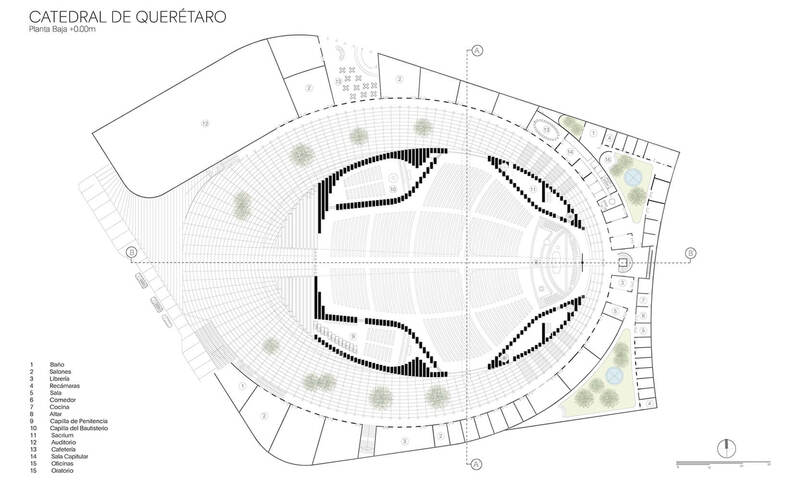 Extending from the atrium is the pathway of the cross park, a public green space formed by two bodies embracing the atrium as a symbol of protection. The idea is that this space will be the new public square for the city's residents. Public parking can be found below the street with space for 500 cars and 30 trucks.